Documents Required For Application of KPT Entry Pass (2D Annual Card) ? I don`t know why, Karachi Port Trust`s Entry Pass renewal process is so complicated for the people to full fill, I have seen many people over there roaming and asking about the application procedure of KPT annual card and what documents are required to attach with. Therefore, I have decided to write an article for the people who want to know the procedure of renewal or getting new KPT`s 2D Annual Card. User can download the required Forms for KPT Pass Issuance or Renewal from here. 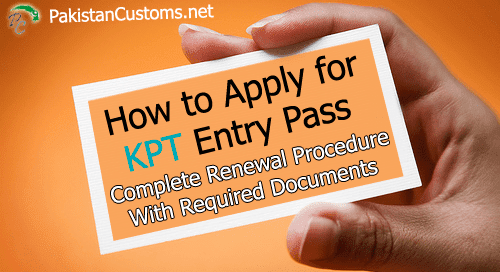 Renewal Procedure of KPT Individual Pass (KPT Entry Pass) ? In order to renew or apply for KPT`s Annual Individual entry pass, we need the below mentioned documents. So after collecting all required documents, he will submit them to KPT`s pass issuing office. Download Aquatech Infrastructure Limited`s KPT Pass Application Forms. Foreigner`s KPT Entry Pass Form. Temporary (Less Than Three Month). Temporary Pass Crew KPT Entry Pass Form. Customs Clearing Agents KPT Entry Pass Form. KPT Office or Employees KPT Entry Pass Form. Government Office or Employees KPT Entry Pass Form. According to the HQ PSF Letter No. HQ/PSF/1364 dated: 18-April-2015, All employees who are working or visiting the Port area must submit completely fill the security clearance form to the HQ Port Security Force along with below listed documents. Powder copy of CNIC (Cleared Visible) With each form.